SAN DIEGO : A single dose of the glucagon-blocking drug REMD-477 can substantially reduce the amount of insulin needed and improve glucose levels without increasing hypoglycemia (low blood glucose levels) in patients with type 1 diabetes, according to the study, “REMD-477, a Human Glucagon Receptor (GCGR) Antibody, Reduces Daily Insulin Requirements and Improves Glycemic Control in People with Type 1 Diabetes (T1D),” presented today at the American Diabetes Association’s 77th Scientific Sessions® at the San Diego Convention Center in San Diego. 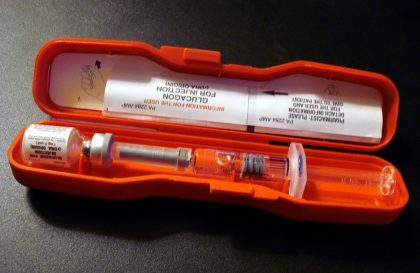 Glucagon is a hormone produced by the pancreas that raises blood glucose and works together with insulin, which has the opposite effect, to tightly regulate blood glucose concentrations. In individuals with diabetes, glucagon effects may not be appropriately balanced by insulin, resulting in elevated blood glucose. The double-blind, randomized, placebo-controlled study enrolled 21 adult patients (8 men and 13 women) with T1D. Prior to being admitted for a five-day, in-patient observation period, all participants’ glucose levels were measured by Continuous Glucose Monitoring (CGM). While under observation, all patients received the same meals and a continuous IV insulin infusion to help maintain glucose levels. Daily insulin use and glucose levels of patients who received REMD-477 were compared on day one versus day four of observation to those who received placebo. Results indicated that those who received the REMD-477 treatment were able to reduce daily insulin use by 26 percent (12 units), compared to those who received the placebo (p=0.02). Participants received CGM for 8 weeks after inpatient observation. Average daily glucose assessed by CGM was 20 to 31 mg/dL lower in the REMD-477 patients than in the placebo patients during the 3 weekly periods after inpatient observation (p<0.05). In addition, the REMD-477 patients’ blood glucose levels were improved without increasing low blood glucose events. Given the long-acting nature and persistent blood concentrations of REMD-477, it is likely that patients may be dosed once per week. This study measured the effect of the glucagon-blocking drug after only one injection. The follow-up study will focus on treating more patients over a longer period of time and will compare weekly injections of two different dose strengths. The results of the follow-up study should provide a more complete picture of how REMD-477 may affect patients’ blood glucose levels, insulin use and weight in an outpatient setting. The study was funded by REMD Biotherapeutics. Dr Pettus is a consultant and author for Sanofi, Novo Nordis, Valeritas, Insulet, MannKind, Senseonics, and Dexcom and is on the speaker’s bureau and is an author for Sanofi and Valeritas. Other study coauthors are employed by and own stock in REMD Biotherapeutics. Dr Powers has used the REMD-477 antibody in research studies but has no financial conflicts of interest related to this research.